Gecko lizards are a common sight out here in the desert. 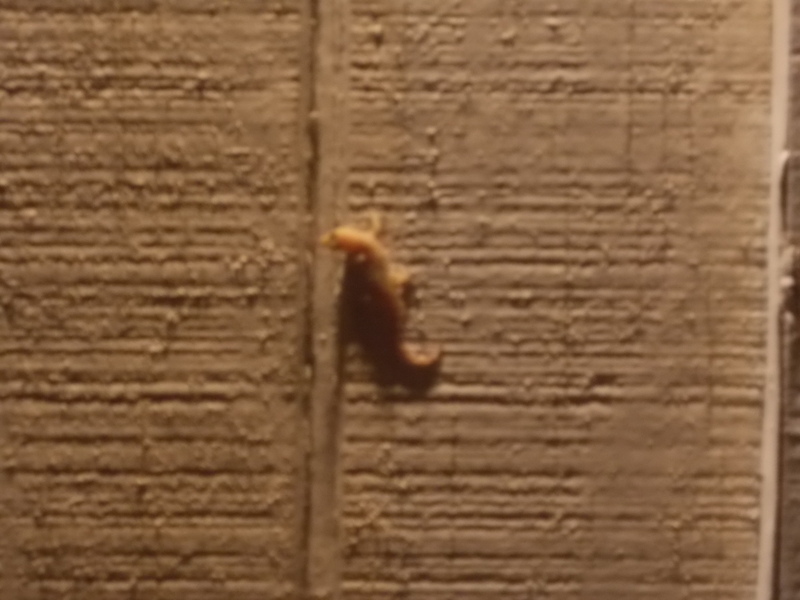 The other night, I noticed one on the outside of my kitchen window. It had obviously been attacked or otherwise frightened because it was missing a part of its tail. Shedding off a part of its tail is a fascinating method that many of these lizards use as a defense mechanism. I grew up with cats – and as you probably know, cats like to play with lizards. So, as a child, it was a common occurrence for me to find these amputated tails, still flopping around. Anyway, I snapped a picture of this lizard on the window – my camera has trouble taking pictures at night, so it’s not super-clear but you get the idea. 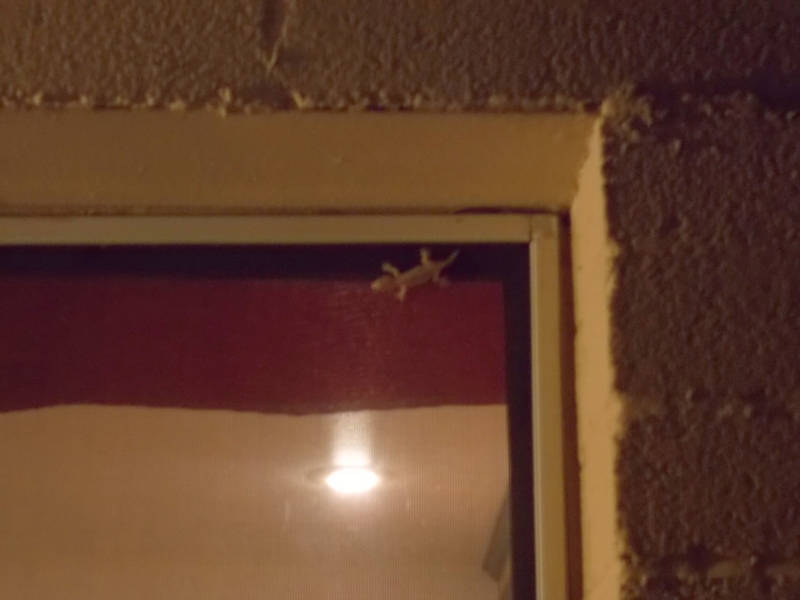 Then, a few nights later, when returning from my evening walk, I noticed another gecko on the outside garage wall, hanging out under the lights. It was blending in quite well with the wall! 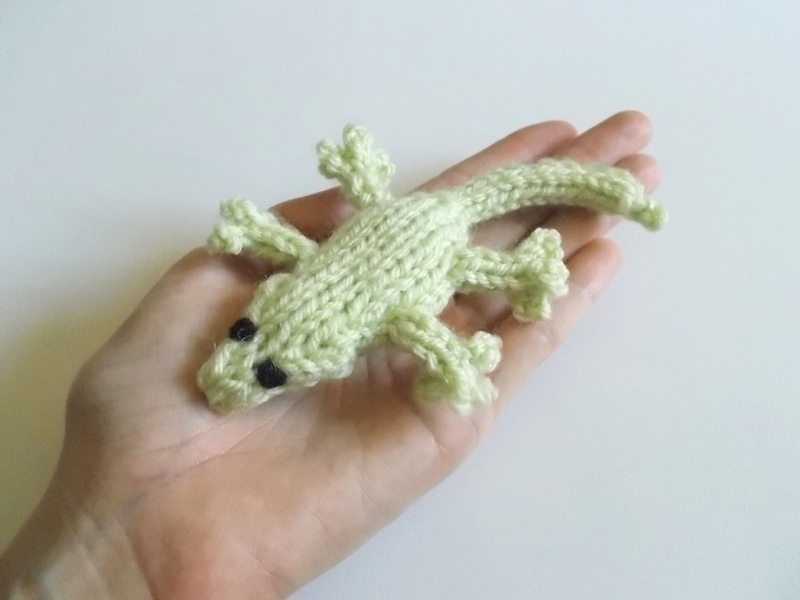 These gecko encounters inspired me to make a knitted gecko! In addition to being a cute, portable toy to play with, it would also make an interesting wall decoration. Any time I’m in the garden section of a home improvement or department store, I always see these sculptural metal lizards – but why spend money on something like that when you can make a hanging lizard decoration using your stash? You could even use these outside on a patio, although they may fade over time from exposure to the elements – but they’re quick enough to make that you could easily whip up some more if they wear out. 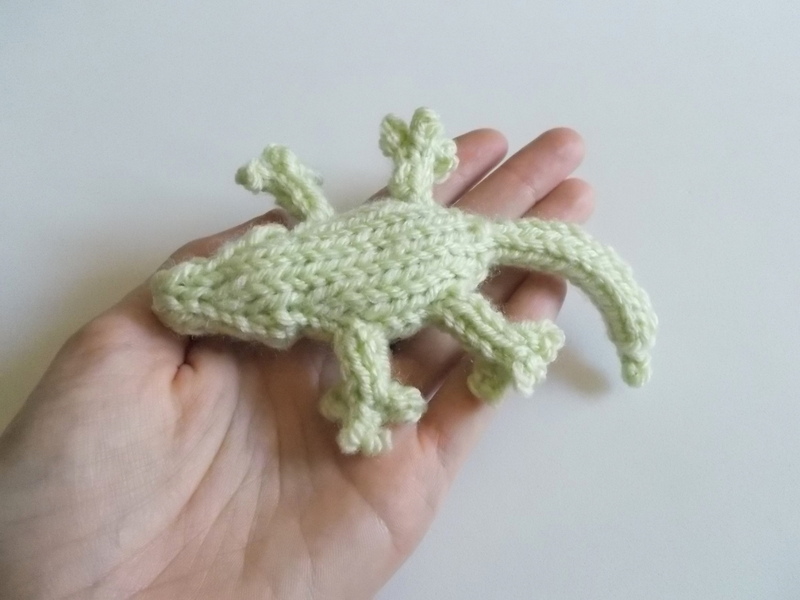 Geckos come in all kinds of colors and patterns, so feel free to experiment with this basic pattern to make your own colorful lizard. I bet they’d look great incorporating some bead-knitting work, for those of you who are adept at that. 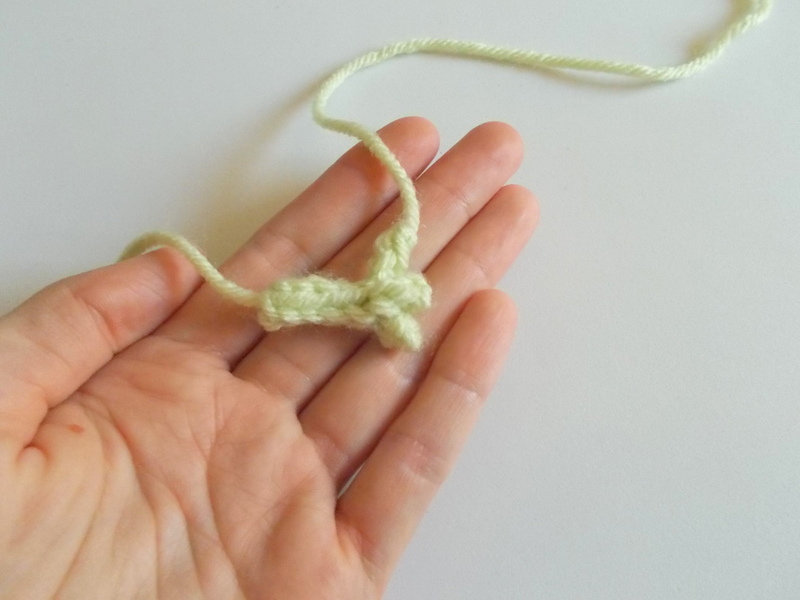 You can also knit more or less rows of i-cord on the tail to change its length. 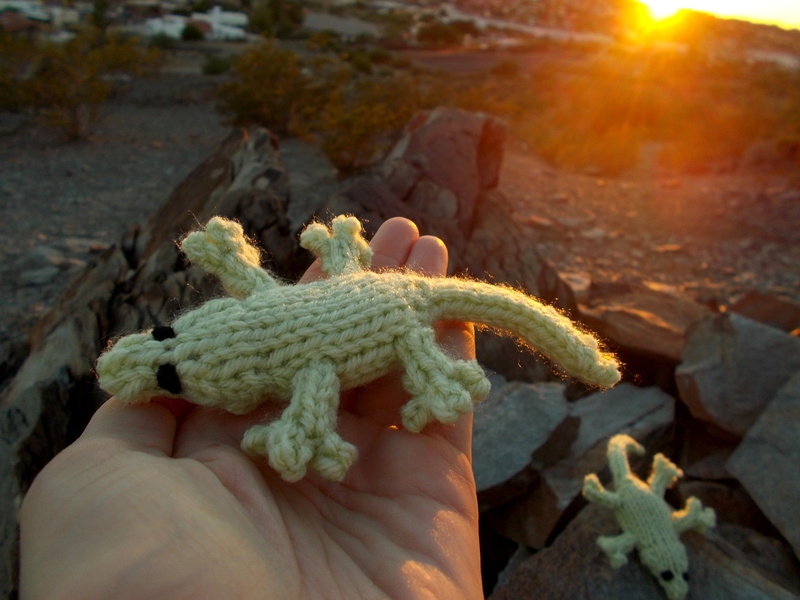 When knitted as written with worsted weight yarn, these lizards measure about 5 inches long. Using light green yarn (or your color choice,) cast on 2 stitches onto one dpn to work as i-cord. Rnd 1-2: Knit 2 rounds i-cord. -Continue to work as i-cord, sliding the stitches to the right end of the needle and pulling the yarn across the back of the work. Rnd 4-15: Knit 12 rounds i-cord. 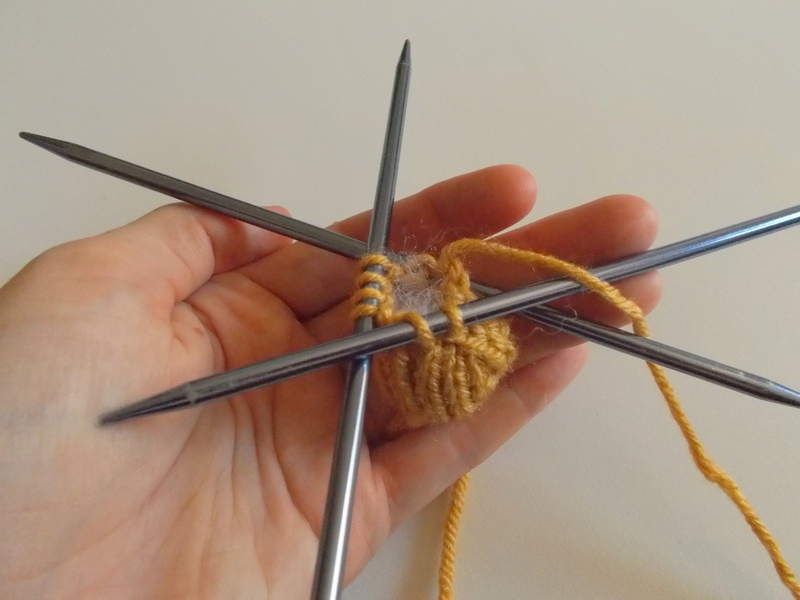 Distribute the 6 stitches onto three dpns and join to knit in the round. Rnd 17: Knit 1 round. Rnd 19: Knit 1 round. Rnd 21-28: Knit 8 rounds. -Stuff the body so far. Rnd 31: Knit 1 round. Rnd 33: Knit 1 round. Rnd 35-36: Knit 2 rounds. -Stuff the head portion of the lizard. Cut the yarn, thread the tail into a tapestry needle and weave through all stitches on the needles, pulling tightly to close. 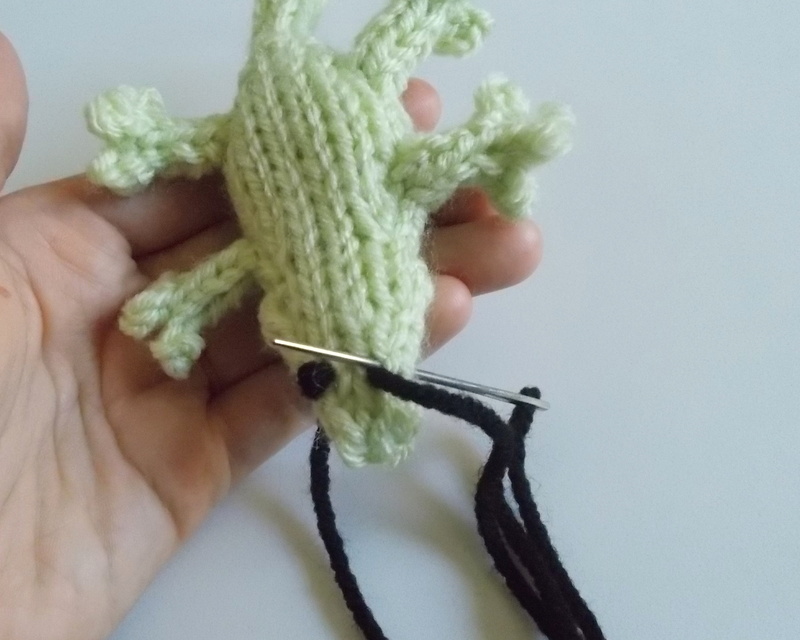 Using light green yarn and leaving a tail for seaming, cast on 3 stitches onto one dpn to knit as i-cord. Rnd 1-3: Knit 4 rounds i-cord. -Again pulling the yarn across the back of the piece as for i-cord, knit only the first 2 stitches of the round. -Cut the working yarn, leaving about 8-12 inches of tail. Thread the tail into a tapestry needle and weave through these two stitches from right to left to finish off. 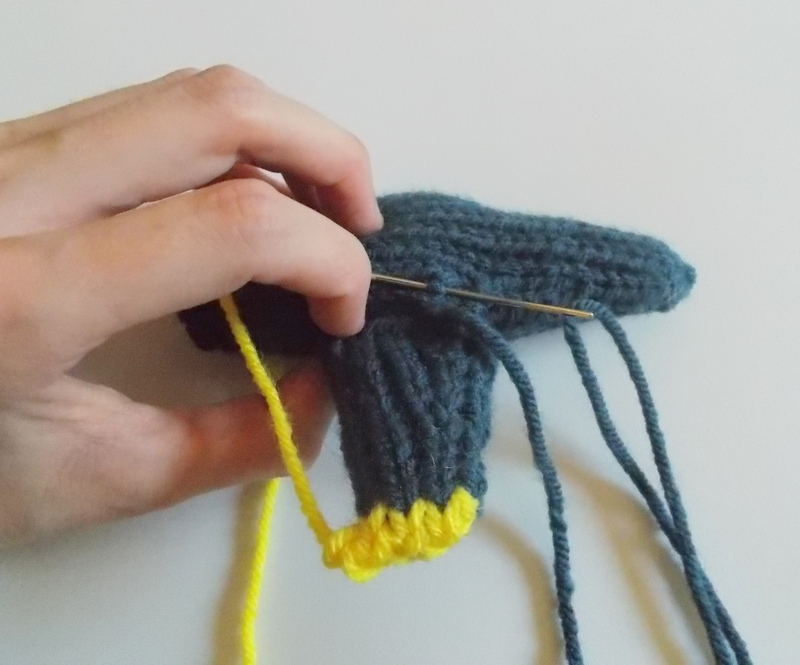 -Weave the tail down through the toe and reattach to the second of the remaining 4 stitches. -Working only on the first two stitches, work 1 round of i-cord. -Again, thread the tail through these two stitches and weave down through the second toe to reattach to the leftmost of the remaining two stitches. -Work 1 round of i-cord on these last two stitches, then thread the tail through them to finish off. -Make 3 more legs in the same manner. -Position the cast on edge of a leg piece against the side of the lizard body, just behind the neck. 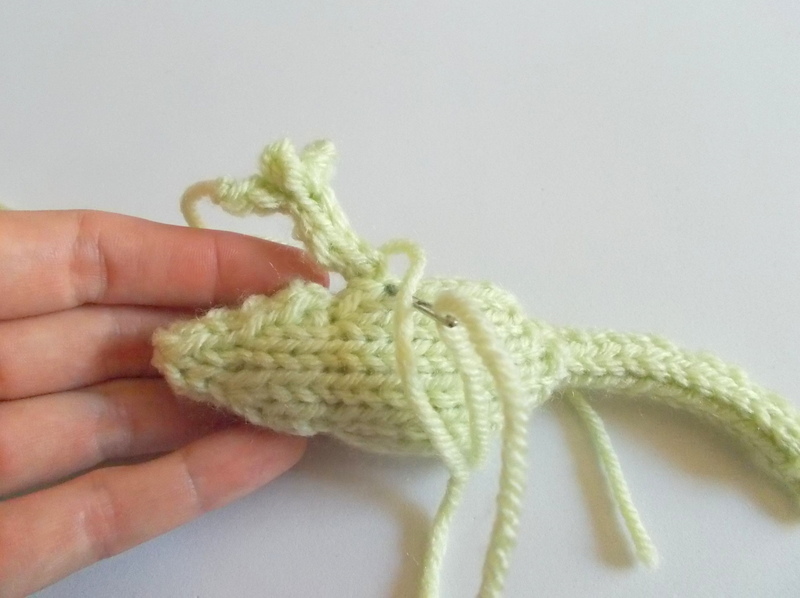 -Using the cast on tail, attach the leg to the body with a few stitches. Note: If you’re giving this toy to a very young child, or you have very young children around the house, make sure to attach the legs well as they are small and could present a choking hazard. -Attach the rear leg in the same manner, positioning it just in front of the tail and in line with the first leg. -Attach the remaining two legs on the opposite side of the lizard. -Weave in the ends. Weave the end at the tip of the toe down through the toe, into the leg, and finally into the body. -Using a small scrap of black yarn, embroider the eyes with a few stitches on either side of the head, a few stitches back from the tip of the nose. Weave in the ends. That’s it! 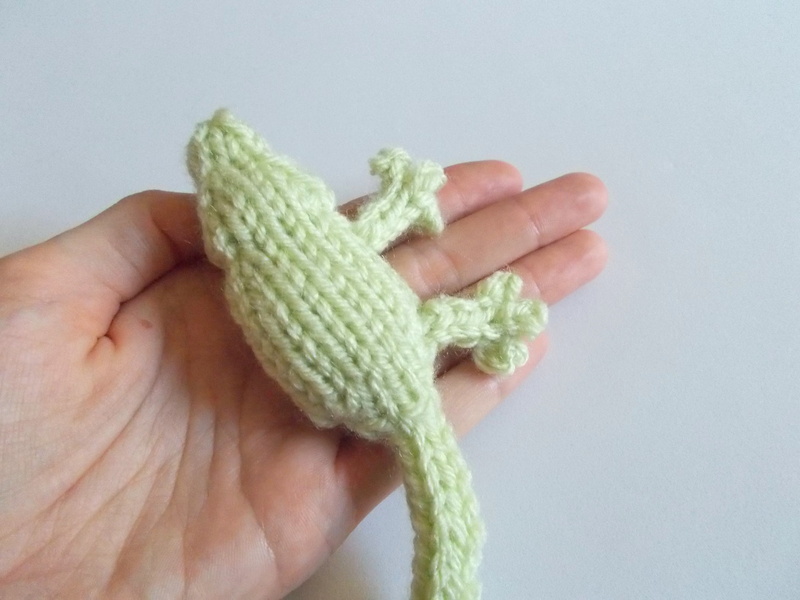 Weave in any remaining ends and enjoy your lizard. If you wish to hang him on a wall, simply thread a small piece of scrap yarn or cord through the piece and tie to make a hanging loop. I hope you’ve enjoyed this week’s free pattern! I’ve just released a new pattern set available for purchase on Ravelry – The “Land And Air” set 2! It contains a pattern for a locomotive and a P51 Mustang fighter airplane! Both are easy to intermediate level toy patterns and are super fun, whether you’re using them as a toy or as home décor! 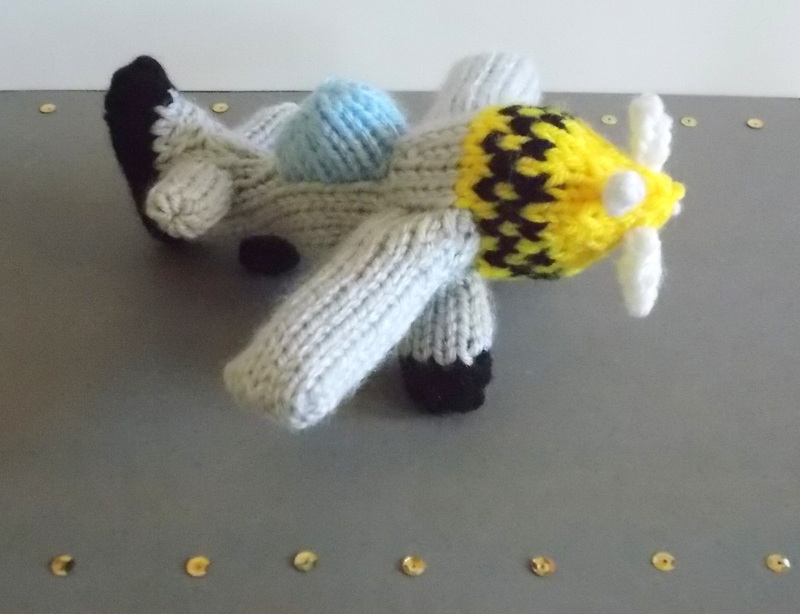 For those who don’t knit, the locomotive and P51 Mustang toys are available in my Etsy shop, hand-knitted by me. In other news, I’ve created a Flickr photo-sharing group – “The DrFrankKnits Playground.” I welcome you to join the group and share pictures of the fun you and your family are having with the toys you’ve made from any of my patterns! Visit http://www.flickr.com/groups/drfrankknits/ for more info. The playground is pretty lonely right now, but eventually I hope to make it a fun place to share a smile with other toy lovers! Thanks for reading! As always feel free to comment if you need help or just feel like chatting. 🙂 I hope you have a wonderful weekend! My mind has been on music this week. Of course, I don’t know that there’s ever a time when my mind isn’t on music! I don’t think a day goes by when I don’t spend at least a few minutes listening to music. I’ve been a violinist since I was 9 years old – with about a 10 year hiatus after high school before picking it up again as an adult. I also made somewhat of an effort to learn acoustic guitar in college. I took a music appreciation course as a bit of a respite from the much more difficult coursework in my molecular biology major. I knew it would be an “easy A” because I could already read music. 😀 Anyway, guitar playing was a component in the class. I never progressed much beyond a few basic chords, and I found that learning a new instrument as an adult is much more difficult than it is as a child. I haven’t really played guitar since. However, I do still play the violin from time to time. Part of me would love to be a concert violinist, but I’m quite inconsistent with the instrument. Some days I play like a virtuoso, some days I sound like that 9 year old squeaking out a rendition of “Twinkle, Twinkle Little Star.” I march to the beat of my own drum, anyway, so playing in a group isn’t really my forte. Therefore, I’m content just being a hobbyist musician! I think music has touched all of our lives in some way over the years, whether we play an instrument or just listen. 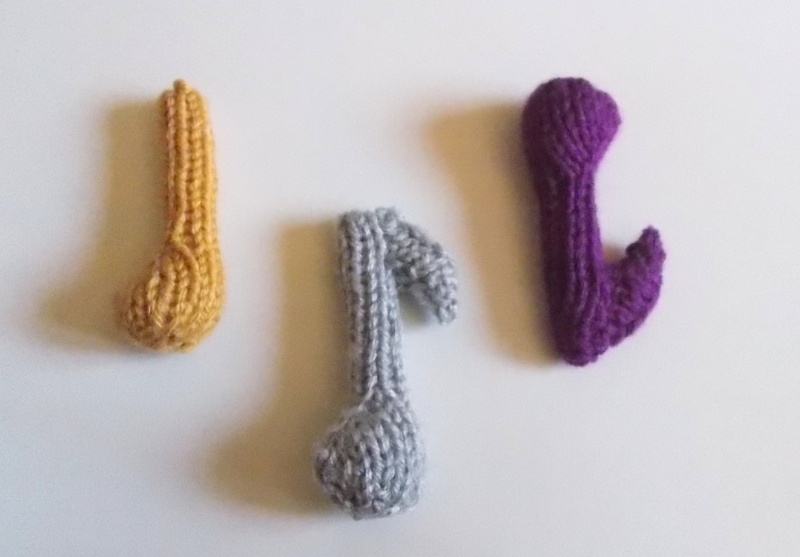 I came up with this cute little musical note pattern to celebrate that love of music! Try hanging several of them up as a garland or mobile for the music room or entertainment area of your house. 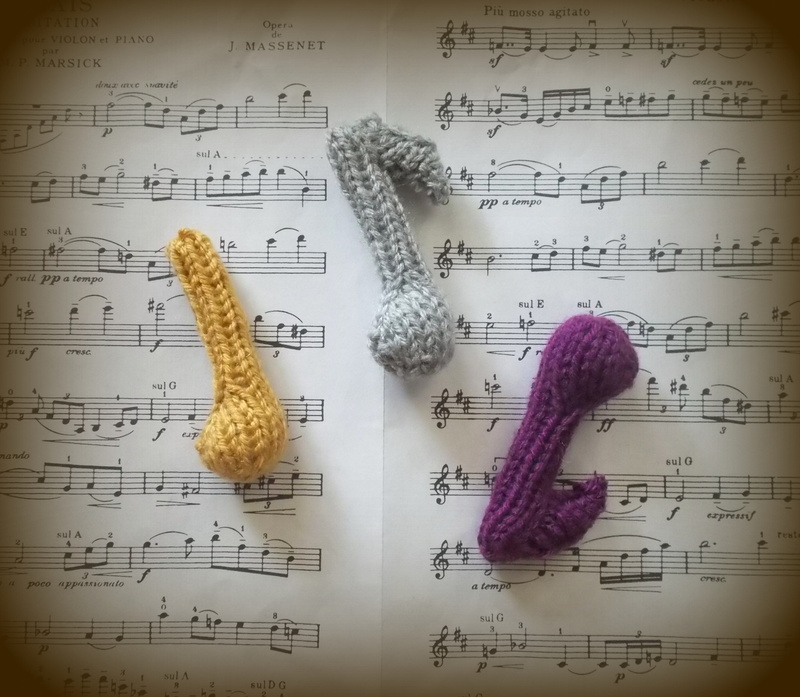 I think they’d make lovely hanging décor for a music classroom if there are any knitting teachers reading my blog! If you or the kids are musicians, try hanging the notes on an instrument case! Similar to the backpack charms from last week, these music notes could serve as a way to identify your case when it’s amongst many similar cases. 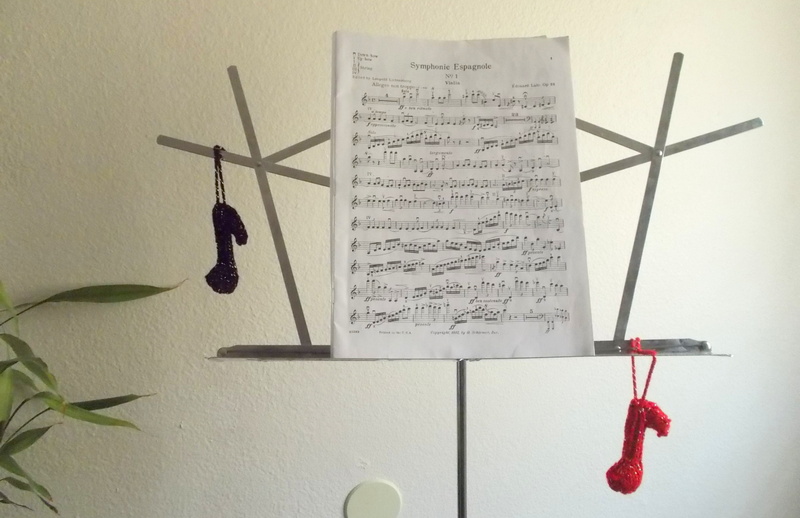 Use them to dress up a boring music stand. Have a music party and use them to adorn gift or treat bags for your guests. They use very little yarn and are super-quick to knit, so you can make lots in different colors to use up some of that stash! As usual, the possibilities are only limited by your imagination! 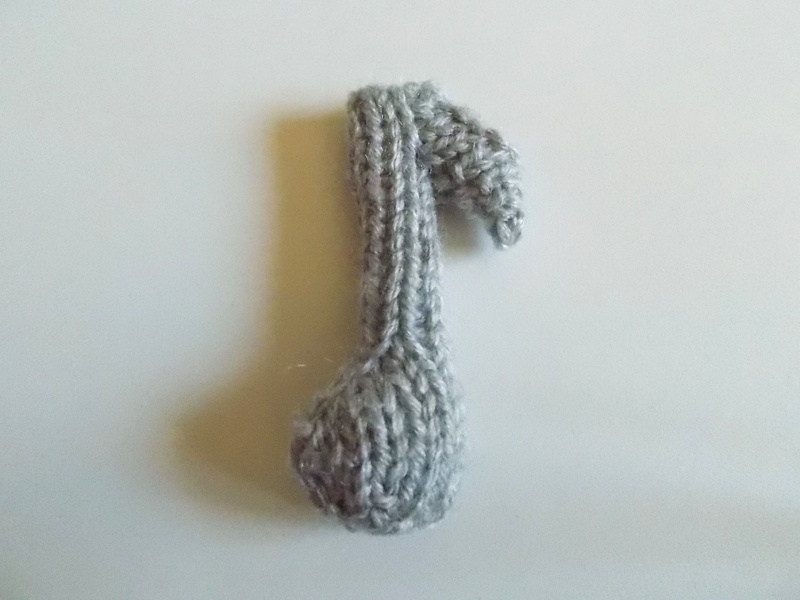 When knitted with worsted yarn, they measure about 3 inches tall. Cast on 6 stitches onto 3 dpns and join to knit in the round. Stuff the rounded portion of the note. Rnd 10-24: Knit 15 rounds, stuffing as you go. -Weave in the ends. 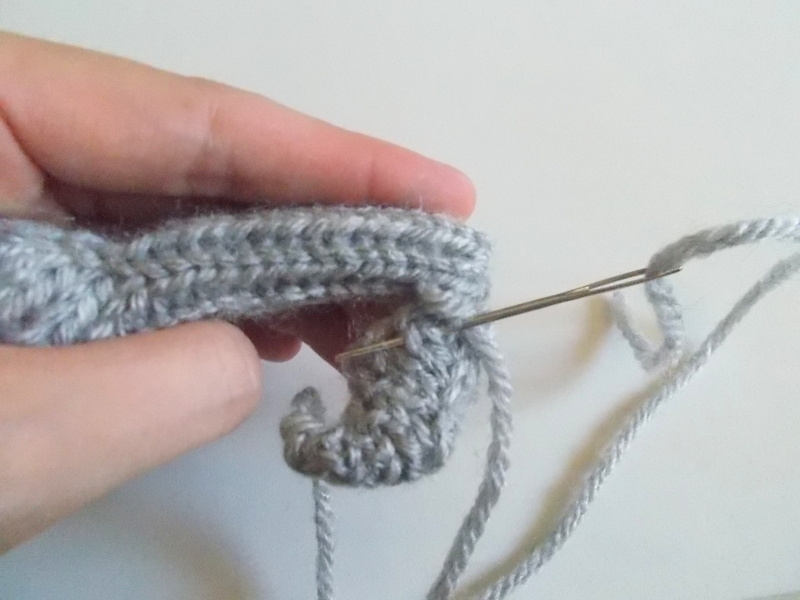 You can use the cast-on tail to cinch up the small hole in the bottom before weaving in. Cinching up the small cast-on hole. If you want a Quarter Note, you can stop right here! If you want an Eighth Note, proceed to the next steps. 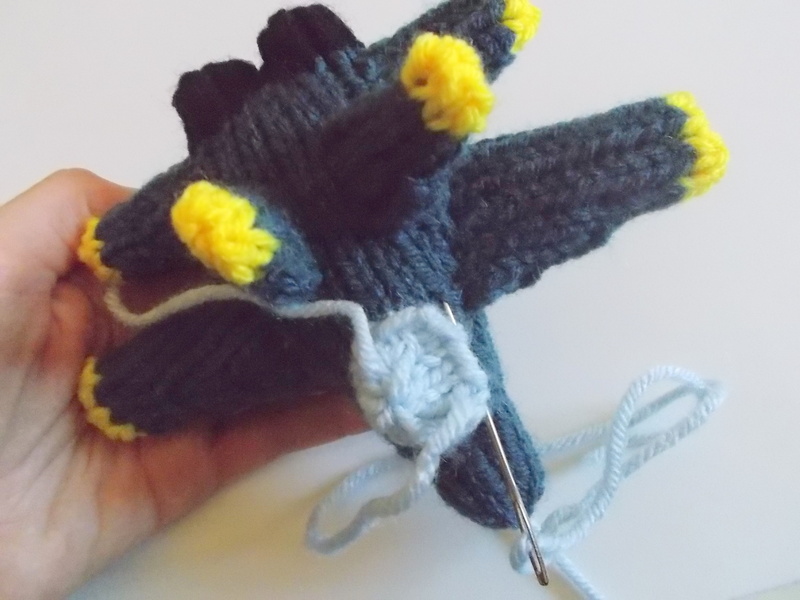 Cast on 10 stitches onto 3 dpns, leaving a tail for seaming, and join to knit in the round. Rnd 3-5: Repeat Round 2 three more times. 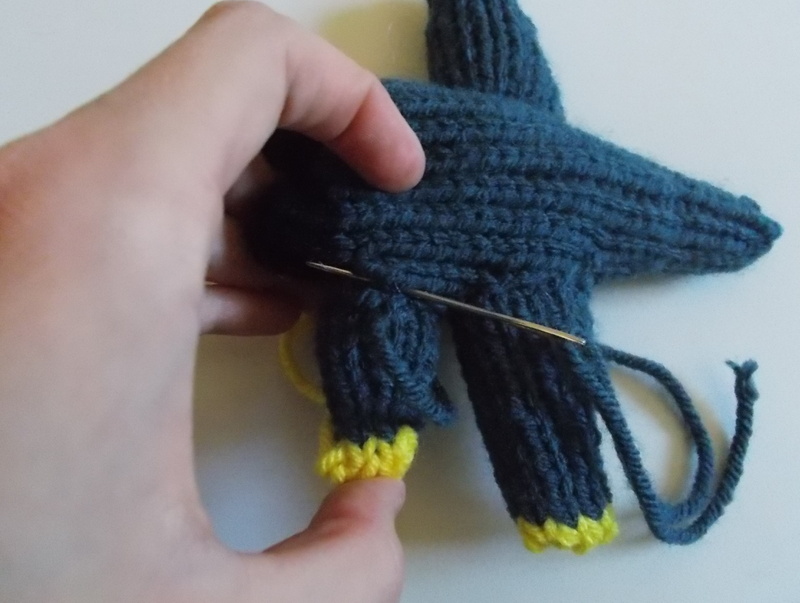 You’ll start to run out of stitches on some of the needles as you make the decreases. Simply redistribute stitches from time to time as necessary. 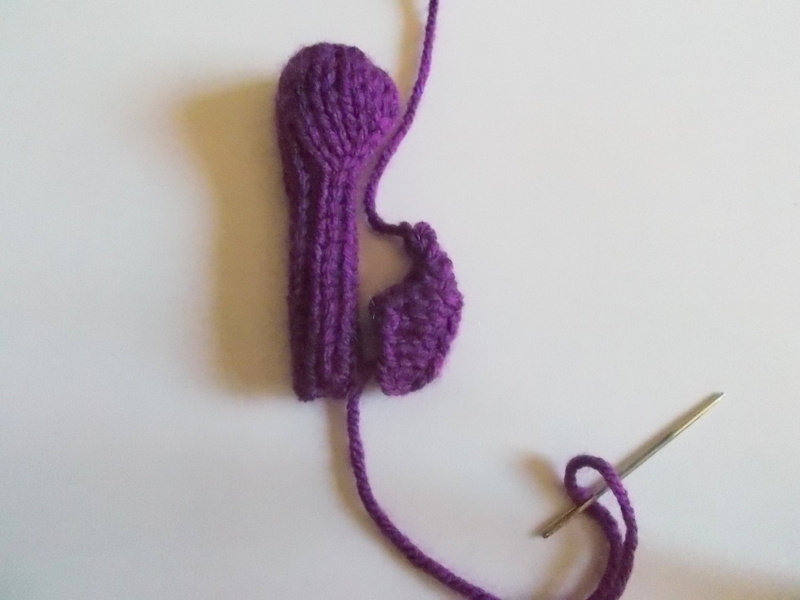 Alternately, you can work the flag on 2 needles instead of 3, with 5 stitches per needle to avoid this. -Distribute the stitches evenly onto 2 dpns (5 stitches per needle) with the working yarn coming off the rightmost stitch on the back needle. Cut the yarn, leaving a tail for seaming. -Stuff the flag piece through the open cast-on edge. -Align the flag along the top of the note shaft. Positioning depends on how you’d like to hang or display the note. Musical convention: If the note shaft is facing up, the note head is on its left and the flag is on its right. If the note shaft is facing down, the note head is on its right and the flag is also on its right. 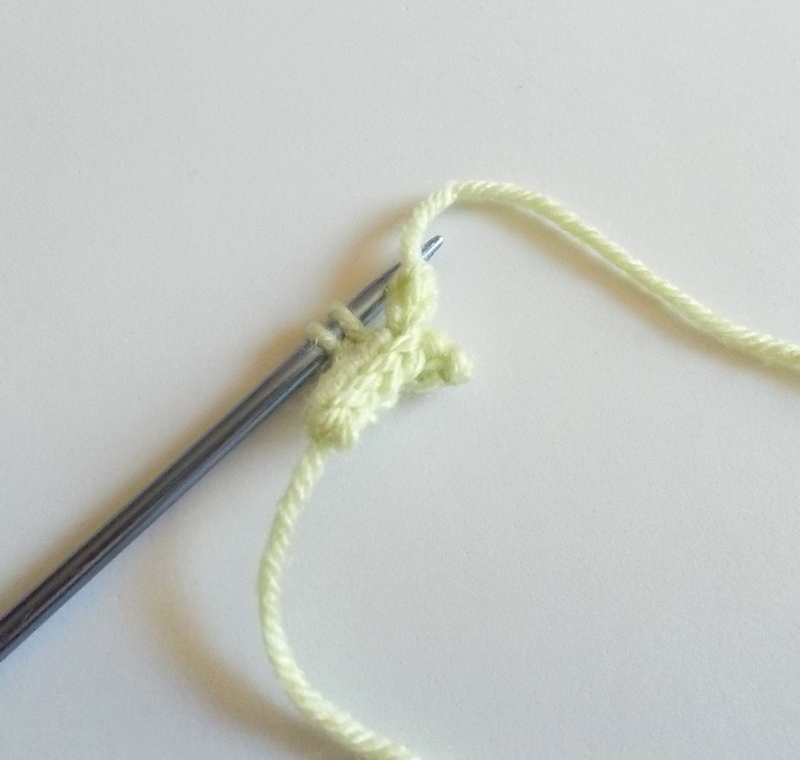 -Using the cast-on tail, stitch the flag to the top of the shaft using mattress stitch. That’s it! Simply thread a piece of yarn or beading wire through the notes and tie in a knot to create a loop for hanging your music notes. 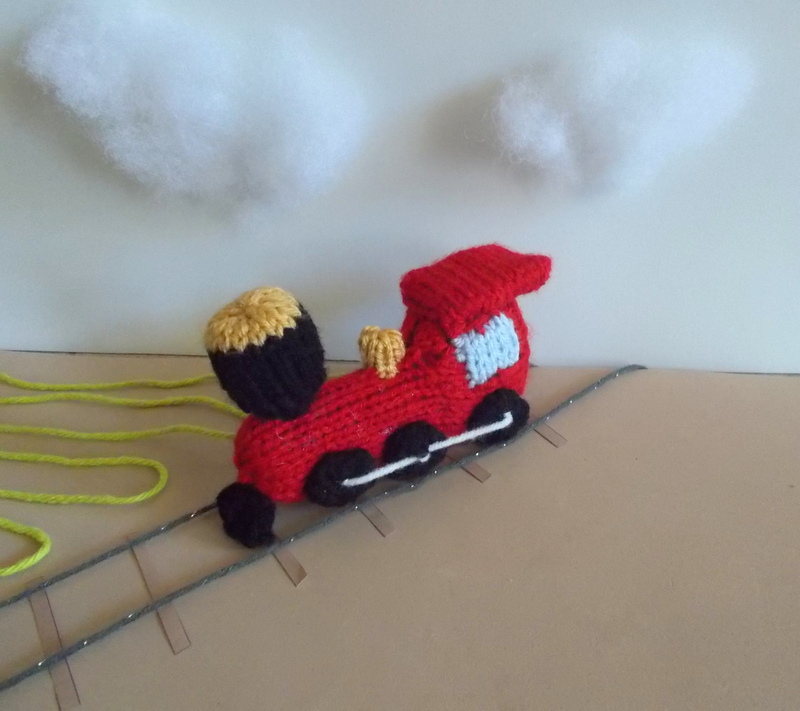 I hope you enjoy knitting this week’s free pattern! 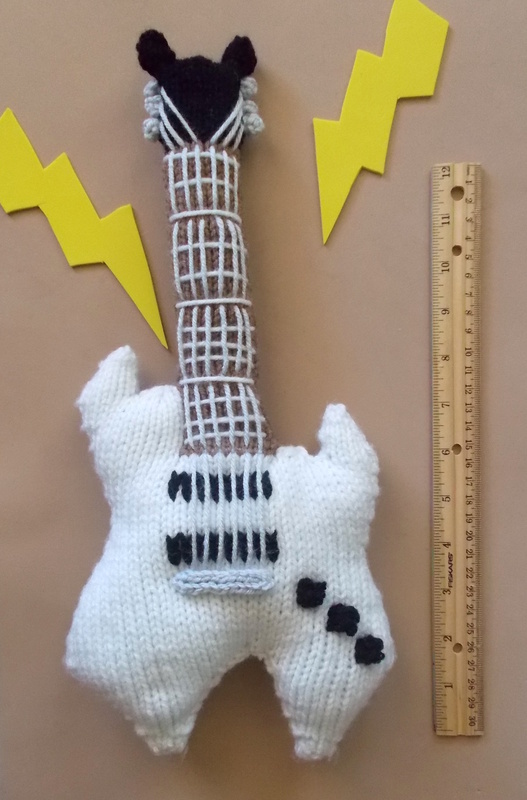 I’ve become kind of sidetracked working on some custom electric guitar toy design requests, so my other upcoming patterns are on hold right now, but all my previously released patterns are still available – you can check them out on Ravelry here! If you haven’t seen them, check out my blog posts from earlier this week for the pictures of the guitars I’ve been creating! I’m really quite pleased with them! I’m planning on making some of the designs that aren’t too mind-numbing available as patterns in the future! My friends often come to me with special design requests – and I hope that you’ll feel free to do the same! 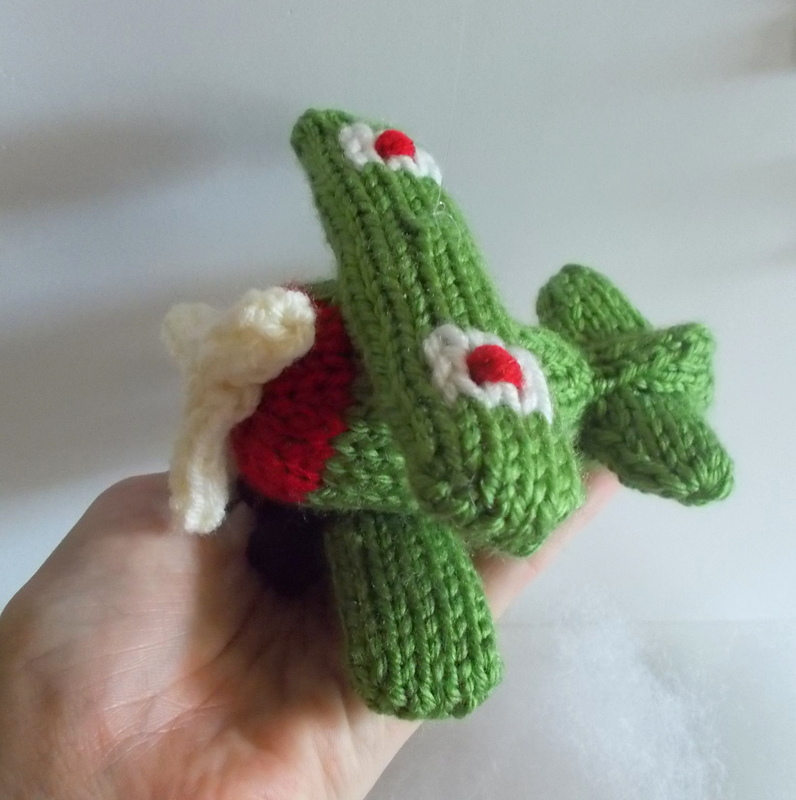 If there’s something you’ve been wanting to see knitted but just can’t find anywhere, by all means, drop me a line about it! You may see it here in the future! Thanks for reading! I hope you have a wonderful weekend! 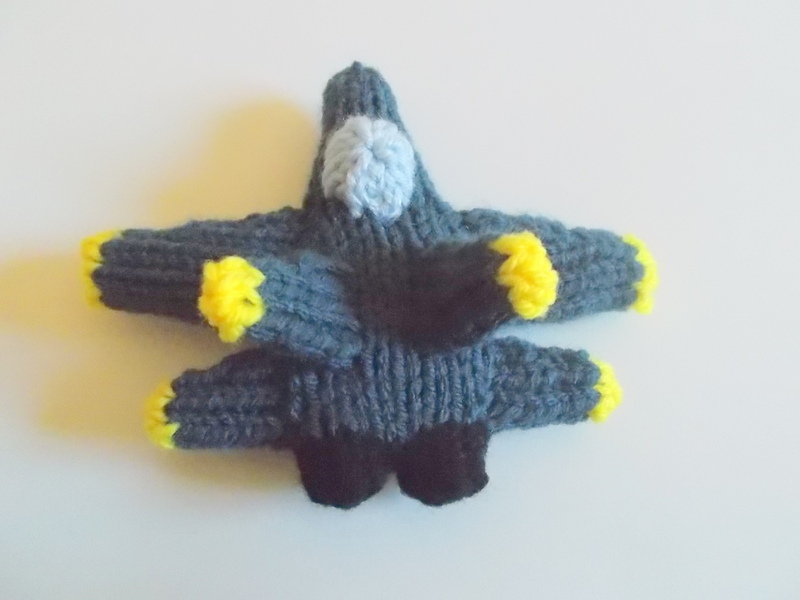 Free Pattern Fridays – Fighter Jets! 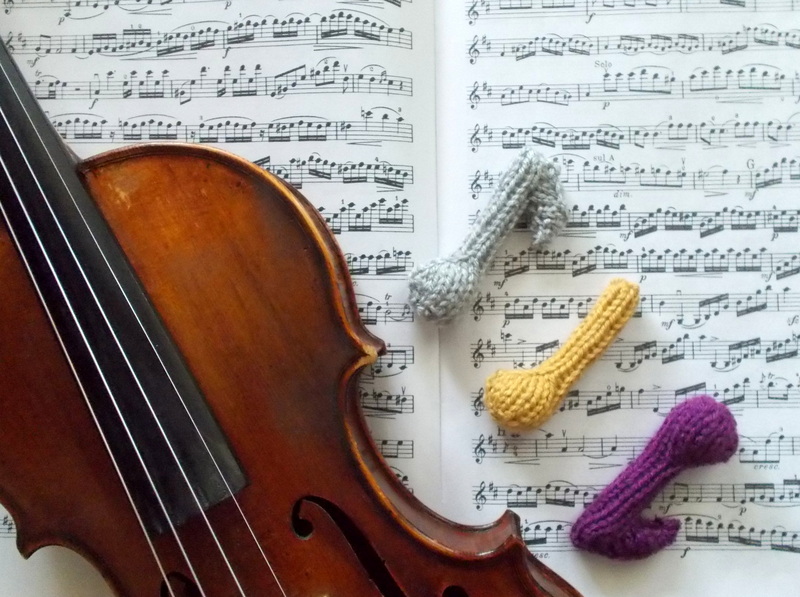 As a knitter who thinks out of the box, I get inspiration from all kinds of places. 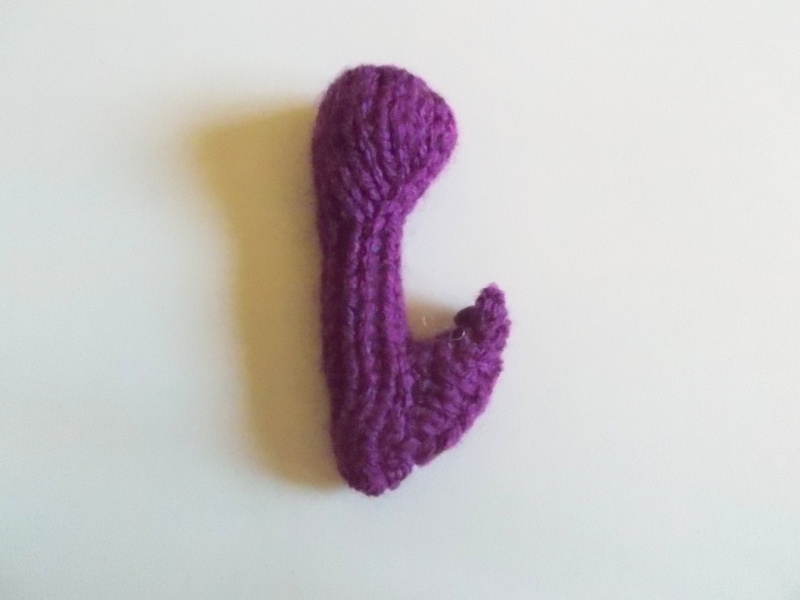 Usually the more “difficult” a shape looks, the more eager I am to try knitting it! I’m a pretty huge stickler for detail as well, and I try to make models as accurate as possible. Given that stuffed toys are safer than their metal or plastic counterparts, I try to design items that not only provide an alternative, but provide an alternative that you and your children would RATHER play with! With that in mind, the charming little details mean a lot to me. 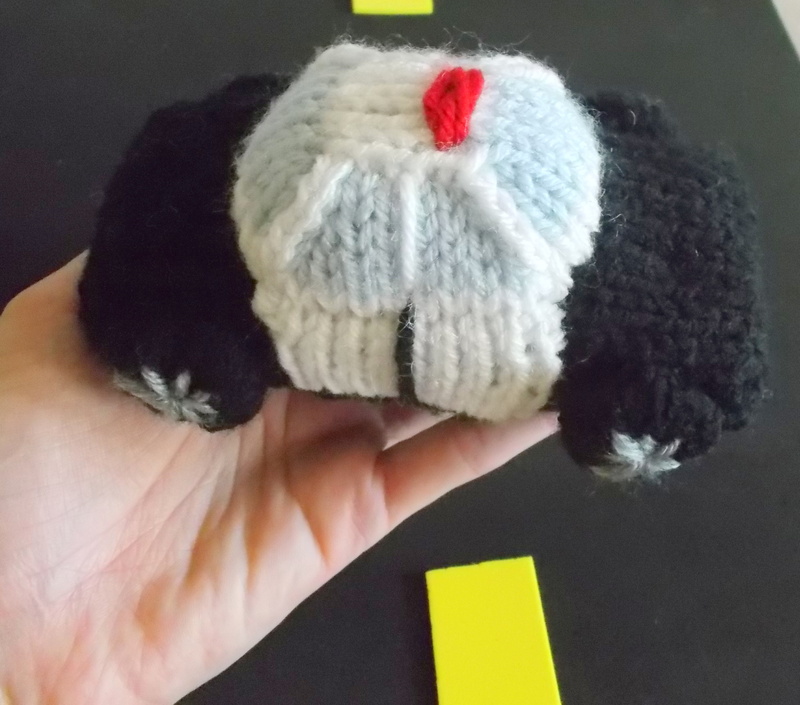 This week’s free pattern was inspired by a trip down the model vehicle aisle at the craft store. Since vehicles are a passion of mine, I love looking at those tiny models! Well, this time I came to the end of the aisle and a Snap-Tite model of a Blue Angels F-18 Hornet Fighter Jet caught my eye. I immediately whipped out my camera and snapped a few pictures! For those unfamiliar with the Blue Angels, they are the United States Navy’s flight exhibition squad. They do all kinds of fancy maneuvers, tricks and formation flying. This little Fighter Jet model, at about 5 inches long and 5 ½ inches in wingspan is the perfect size for taking with you wherever you go. 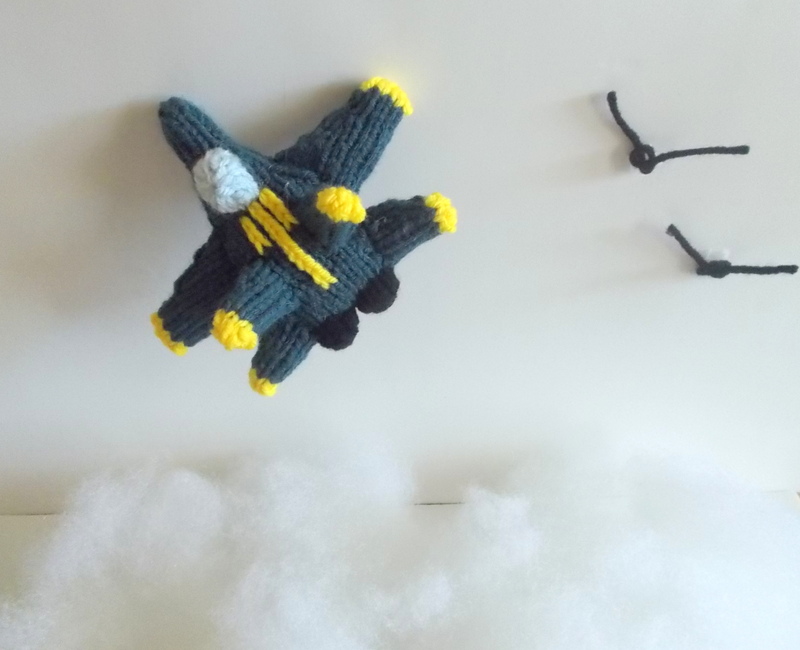 Also, the little ones can toss it around to make it “fly” without the worry of causing damage or injury. I bet they’d make a pretty awesome mobile or other hanging display, too. 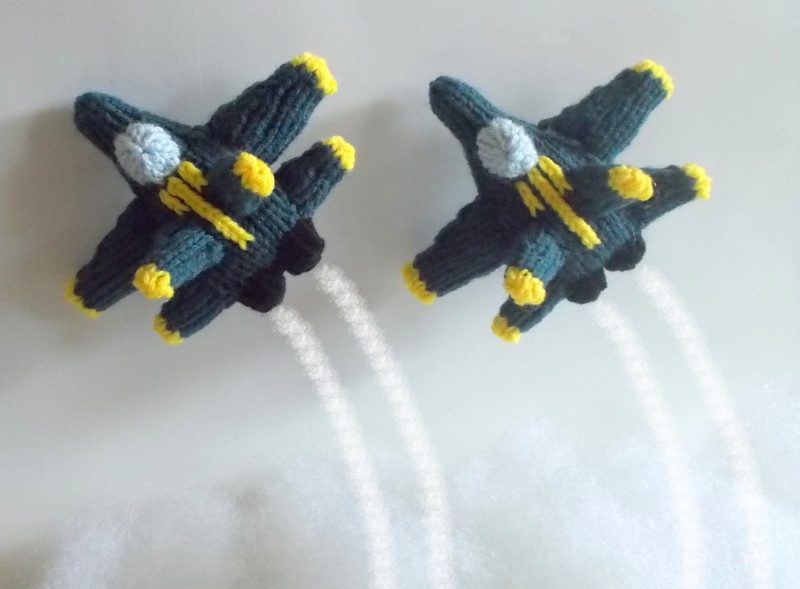 I made my models in the blue and yellow signature colors of the Blue Angels squad, but you can try knitting it in your child’s favorite colors, or forego the color changes and make it a single color. The model would also take well to additional embroidered or felt details to make it special for your family! I hope you love it as much as I do! 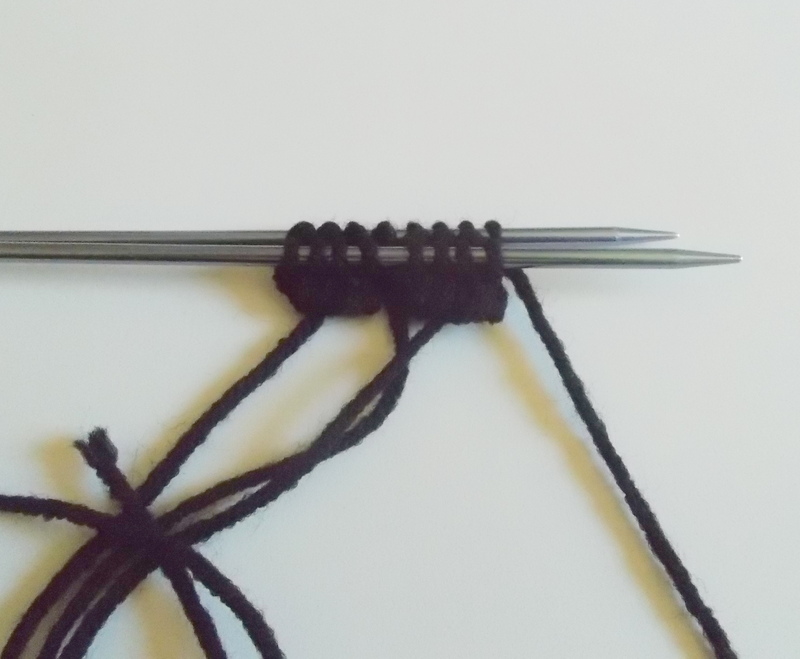 Using black yarn, cast on 8 stitches evenly onto 2 dpns and join to knit in the round. Rnd 1-2: Knit 2 rounds. 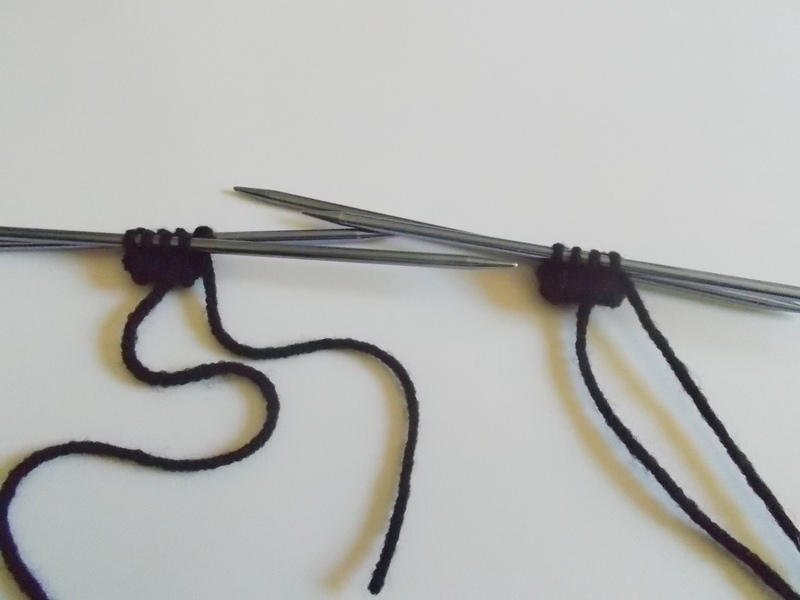 Cut Black Yarn, leaving a short tail. 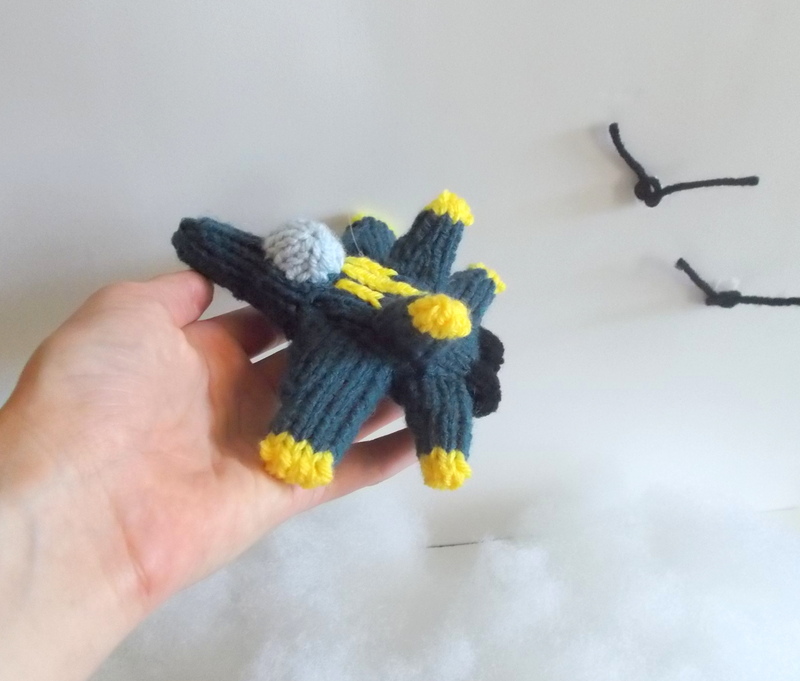 Set this thruster piece aside – you may leave it on the needles. Onto 2 more dpns, cast on 8 stitches and join to knit in the round. Repeat Rounds 1 and 2 above to make a second thruster. Do not cut the black yarn. -Line up the stitches from the two thrusters as pictured. The working yarn is coming off the rightmost stitch on the back needle of the set on the right. 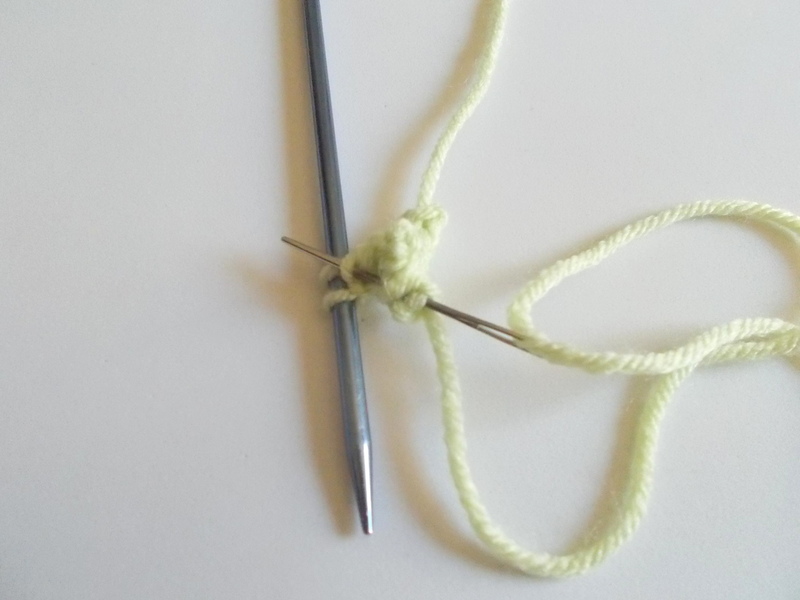 -Slide the front four stitches from the right set of needles onto the front needle of the left hand set. 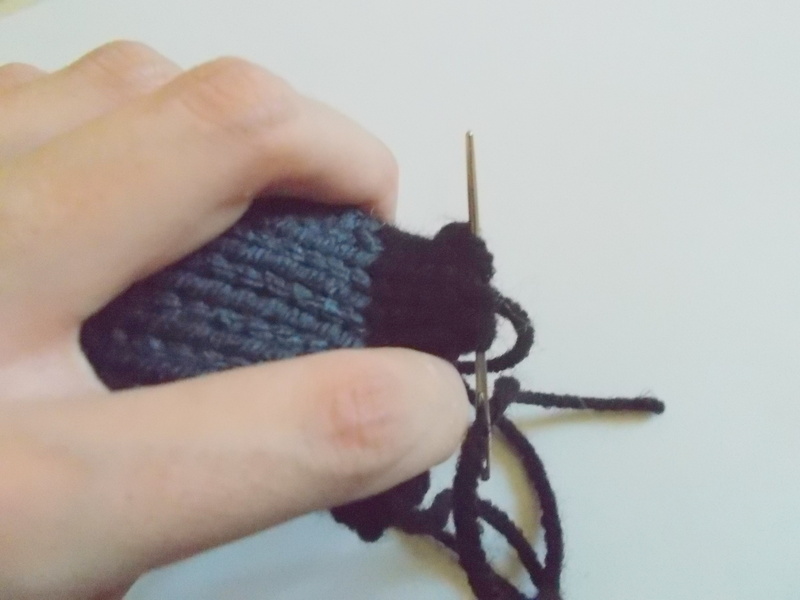 -Slide the back four stitches from the right set of needles onto the back needle of the left hand set. -You’ll now have two needles with 8 stitches apiece on them, with the working yarn coming off the rightmost stitch of the back needle. Now the thrusters are side-by-side waiting to be joined. 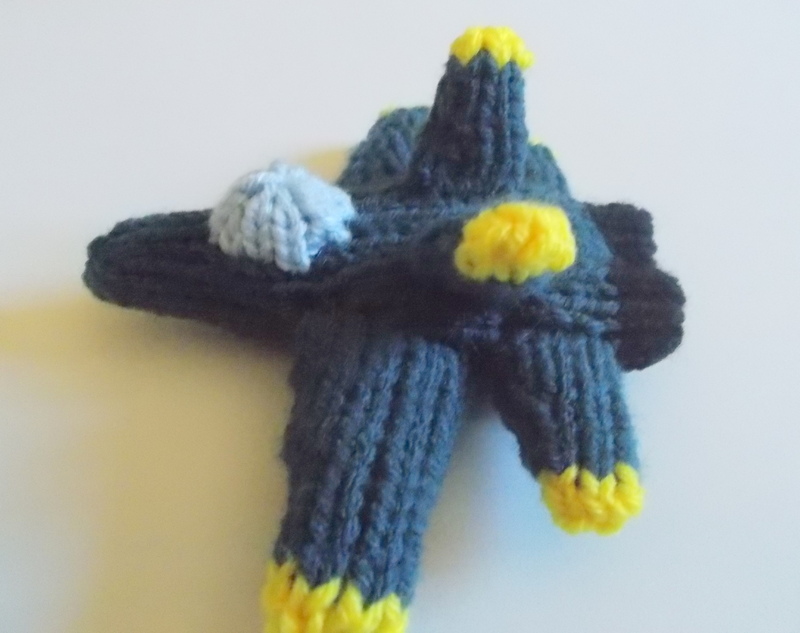 Cut the black yarn, and join the dark blue yarn. 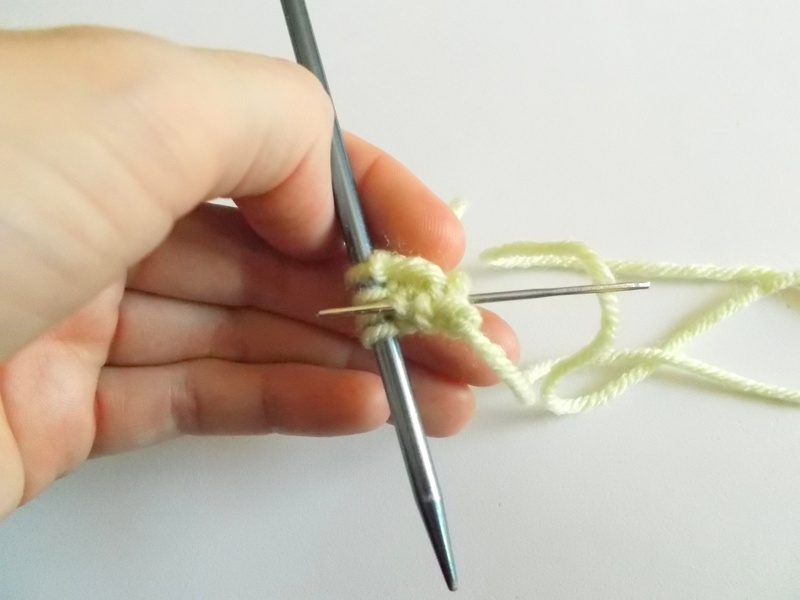 Distribute the 16 stitches onto 3 dpns (for easier working) and continue to knit in the round. Rnd 3-4: Knit 2 rounds. Rnd 6-15: Knit 10 rounds. Rnd 19-22: Knit 4 rounds. Rnd 24-29: Knit 6 rounds. Add some more stuffing to the nose piece. Cut the blue yarn, thread the tail into a tapestry needle and draw through all stitches on the needles, pulling tightly to finish. -Weave the end back down into the closed up nose and into the toy to secure. -Add a little stuffing to the thrusters through their cast-on openings. Weave the black cast on tails through the loops of the cast on edge, pulling tightly to cinch closed. Weave the ends through the closed up thrusters and into the toy to secure. You may use the tail between the two thrusters to close up any gap there – then weave in that end as well. 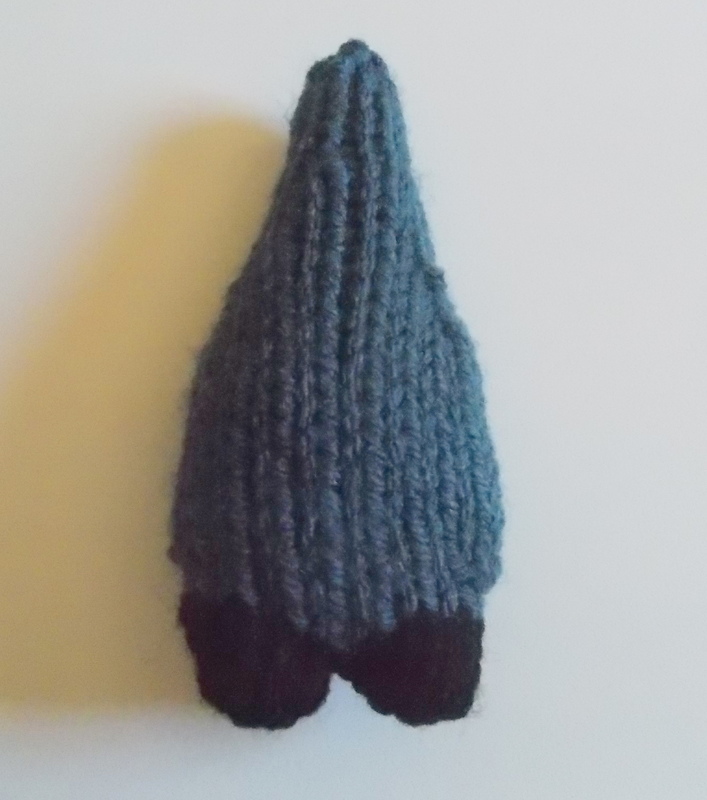 Using Dark Blue Yarn and leaving a tail for seaming, cast on 12 stitches onto 3 dpns and join to knit in the round. Rnd 5-7: Knit 3 rounds. Rnd 9-11: Knit 3 rounds. 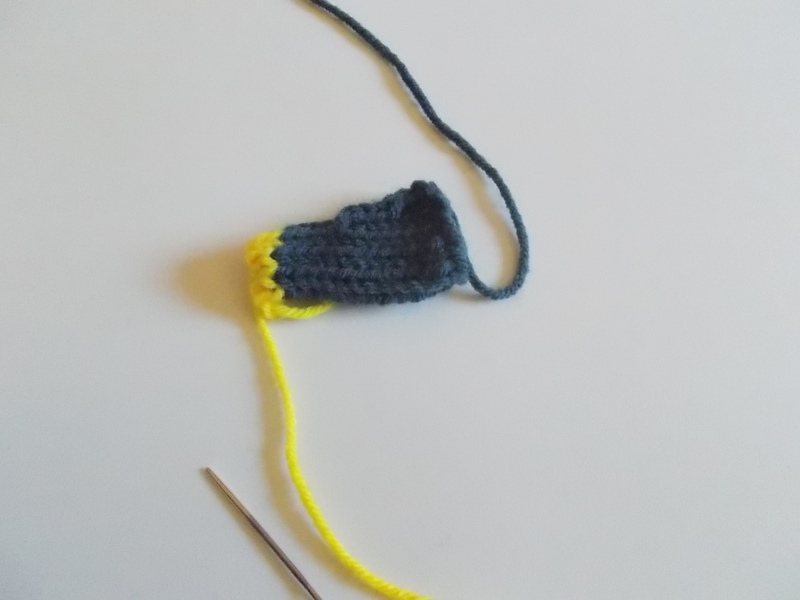 -Cut the blue yarn and join the yellow yarn, continuing to knit with yellow. Rnd 12-13: Knit 2 rounds. 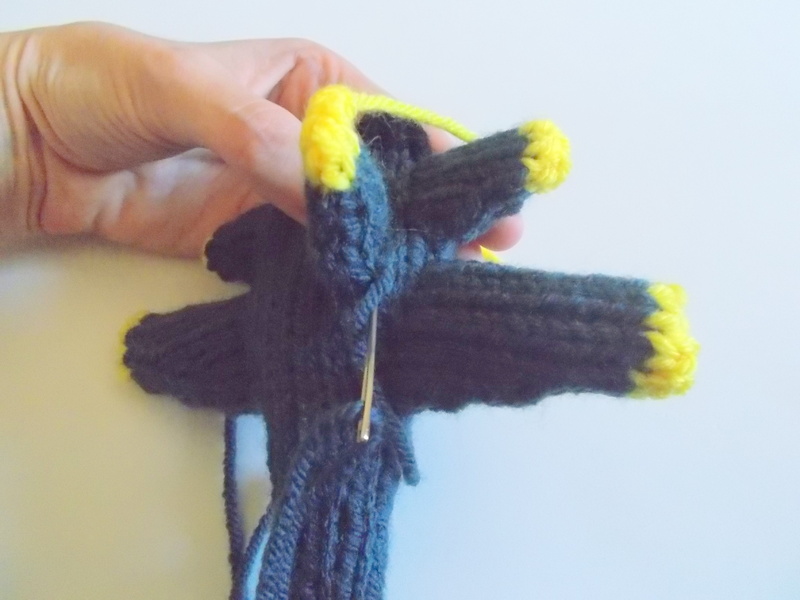 -Cut the yellow yarn, leaving a short tail for seaming. -Divide the 8 stitches evenly onto 2 dpns (4 stitches per needle), with the working yarn coming off the rightmost stitch on the back needle. -Lightly stuff the wing, press it flat, then place it against the side of the fuselage, with the decrease seam facing the nose of the aircraft, and the front edge of the wing lining up at approximately the second decrease round on the fuselage. -Pin in place if you like, then seam the wing to the fuselage using the tail and mattress stitch. 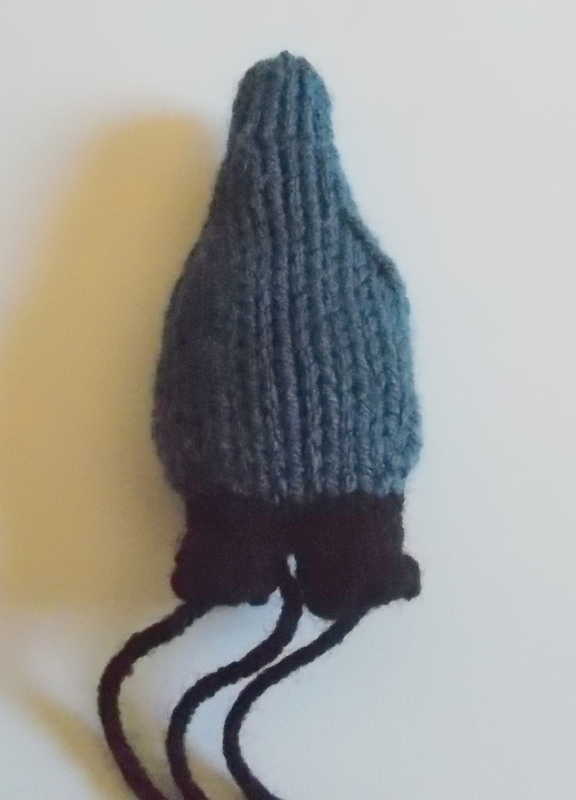 Using Dark Blue Yarn and leaving a tail for seaming, cast on 8 stitches onto 3 dpns and join to knit in the round. 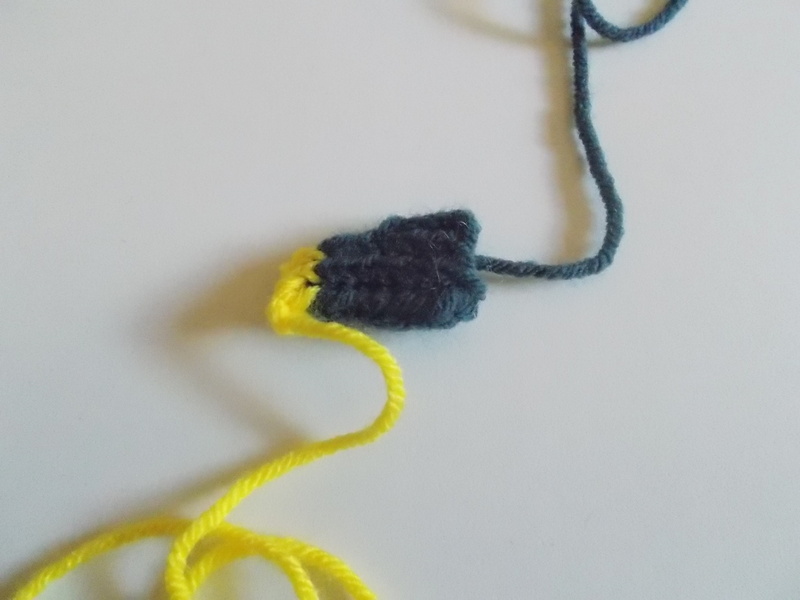 -Cut the blue yarn and switch to yellow yarn. 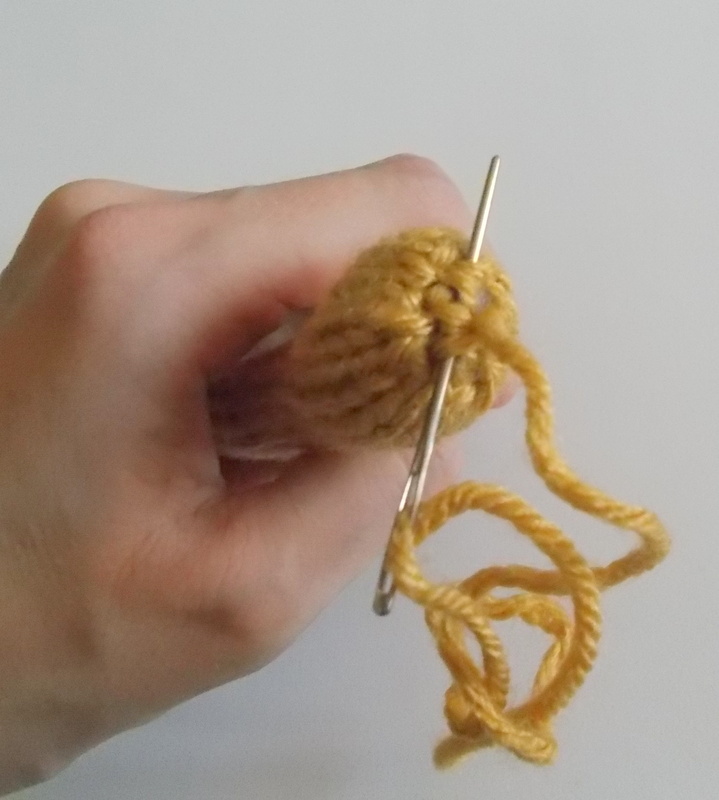 Continue knitting with yellow yarn. Rnd 7-8: Knit 2 rounds. -Divide the 6 stitches evenly onto 2 dpns (3 stitches per needle), with the working yarn coming off the rightmost stitch on the back needle. -Repeat all steps to make 4 of these pieces. -Lightly stuff a rear wing piece, press it flat and line it up along the fuselage, just behind the front wing, again with the decrease seam facing the front of the plane. -Pin in place if desired, then seam the rear wing to the fuselage using the tail and mattress stitch. -Repeat on the opposite side of the plane with a second rear wing piece. -Lightly stuff a rear wing/tail fin piece, press it flat and place it on top of the fuselage, centered between the front and rear wings, about a stitch in from where the wings were attached. 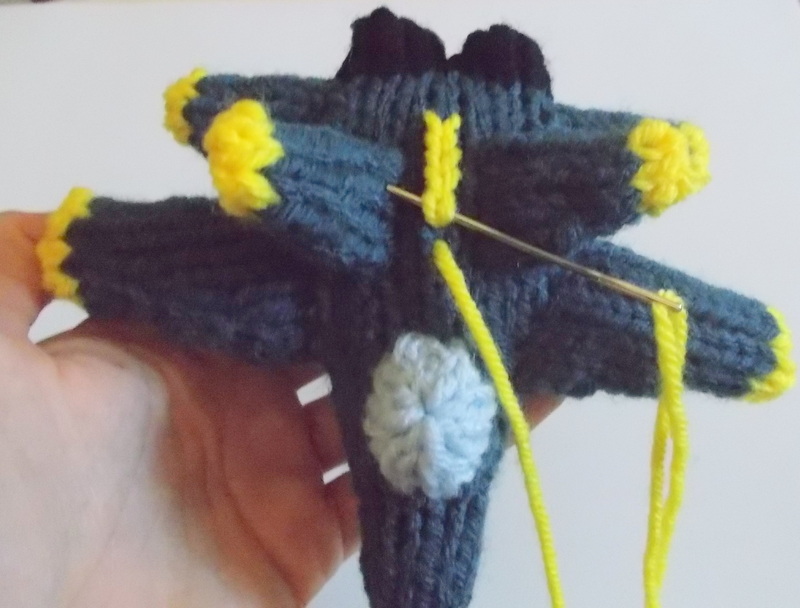 -Pin in place if desired, then seam the fin to the fuselage using the tail and mattress stitch. -Repeat to make a second fin on the other side of the top of the fuselage. 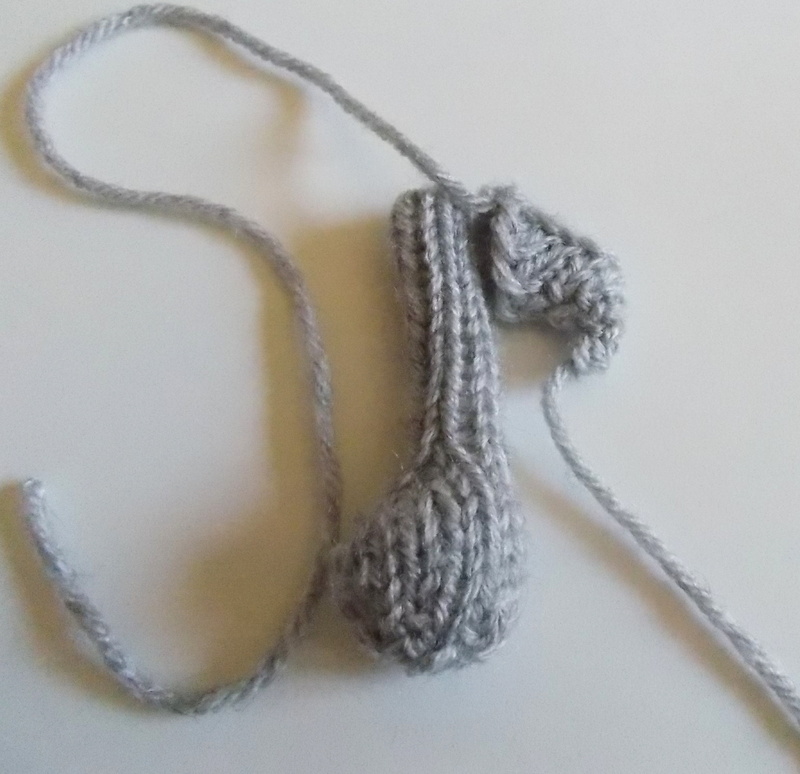 Using Light Blue Yarn and leaving a tail for seaming, cast on 12 stitches onto 3 dpns and join to knit in the round. -Cut the light blue yarn, thread the tail into a tapestry needle, then weave through all stitches on the needles, pulling tightly to close. -Lightly stuff the cockpit piece, then position it on top of the fuselage, just in front of the front set of wings. -Pin in place if desired, then seam the cockpit to the top of the fuselage using mattress stitch. Add some more stuffing if necessary before closing the seam. 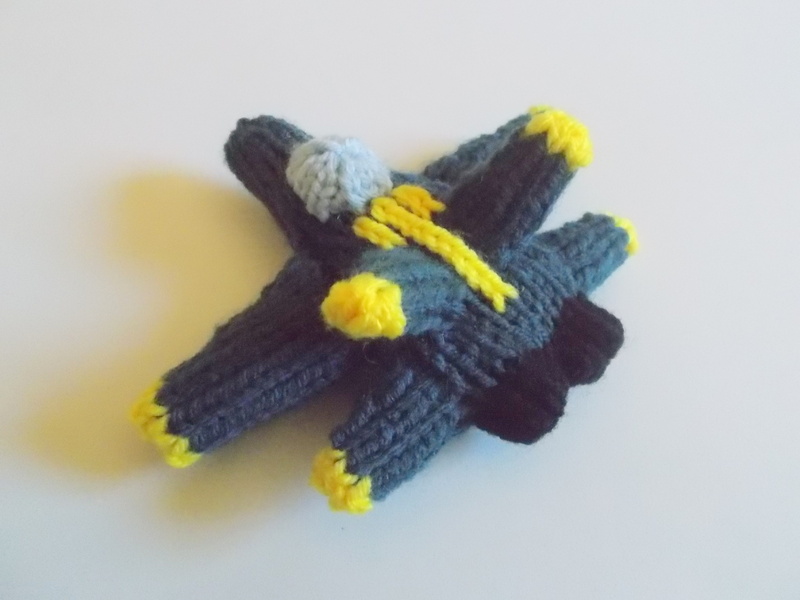 -Cut a strand of yellow yarn and make a line of duplicate stitches as shown along the top of the fuselage between the fins, and stretching from the cockpit to just in front of the thrusters. Make two more lines of duplicate stitch flanking this center line, stretching from the cockpit to the front of the fins. -Alternately, if you’re not comfortable with duplicate stitch, you may embroider several long straight stitches for the stripes … or use some felt scraps … or leave them off entirely as you like. -Weave in any additional ends. In shop news today, I have a new “Land and Air” pattern set available. I’m hoping to have a series of these types of pattern sets in the future featuring different types of vehicles. 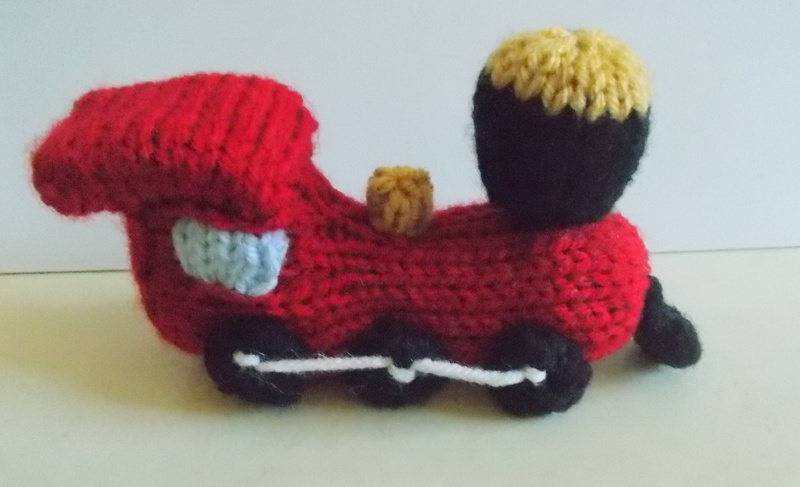 This first one includes a pattern for an adorable classic biplane and the sweetest little police car you’ve ever seen! 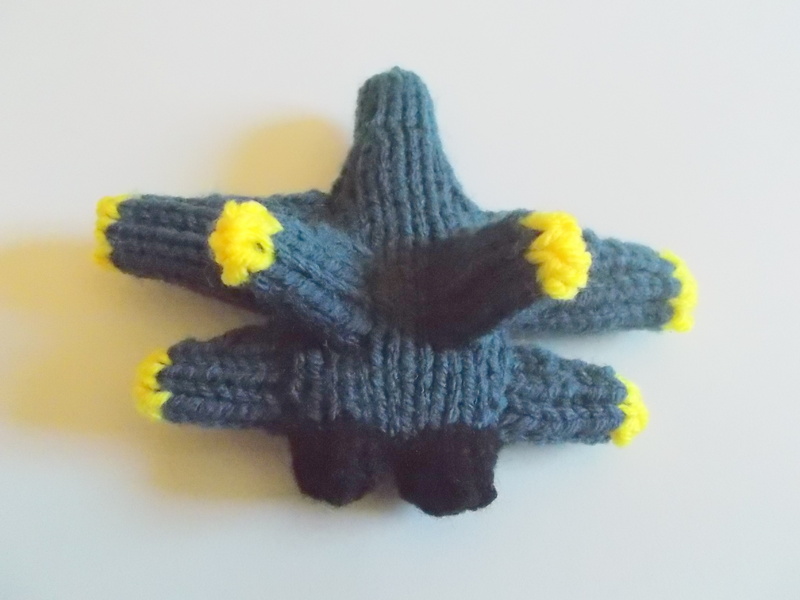 I’d classify them as intermediate level patterns, with the police car being slightly more advanced (read: fiddly) however if you can knit this fighter jet, you should be just fine on both of them. In other news, I’ve made this set and all of my other for sale patterns available as Ravelry purchases for your convenience! Check out my designs page at http://www.ravelry.com/designers/ilana-r-marks ! 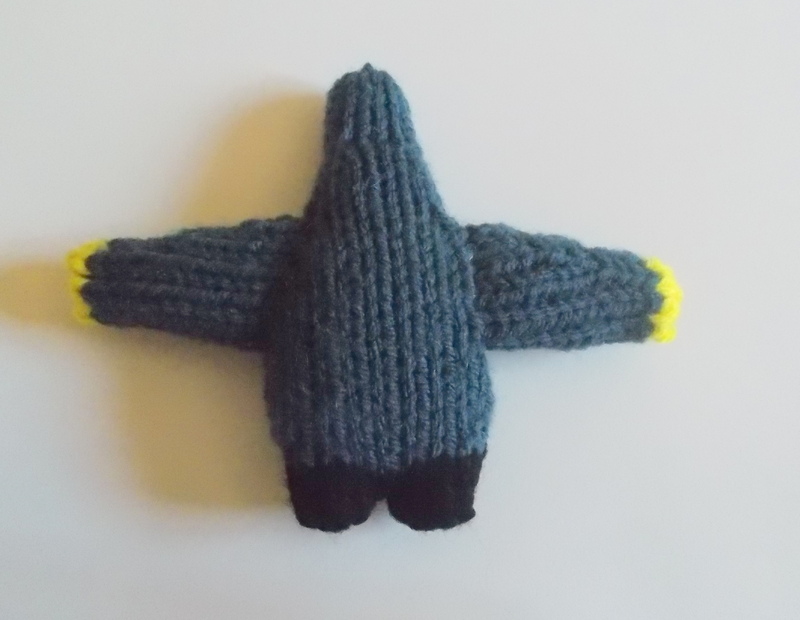 Thanks so much for stopping by for this week’s Free Pattern Friday! As always, if you have any questions, suggestions, comments … or just want to chat, I’d love to hear from you! Have a wonderful weekend and I hope to see you back here next week!